Or click on pictures to enlarge. At this time of year, it might be winter one day and spring preview the next. I don't mind these smaller storms we're having, as they're easier to clean up. And everything coated with snow can make a beautiful landscape. When the snow melts, and I walk outside, I can catch tiny signs of spring. Just a bit of green at the base of catnip or comfrey. 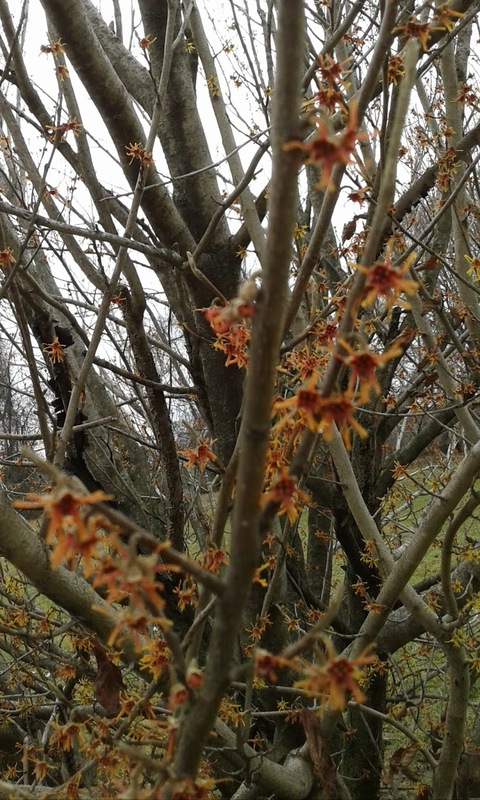 And although they're small, when witch hazel blooms like this in February, it's quite a ahow. And, inside, it's easy to see that spring is approaching. 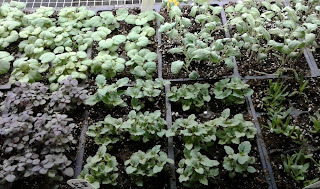 The basement is filling up with seedlings, and even when they're small, each plant's individual characteristics start to develop. Soon, I'll start potting plants in the greenhouse, and spring will be in full swing! So far, we've made it through the winter storms with no problems. The small snowfalls were easy to clean up. This last storm sounded more ominous, but didn't develop as advertised. We had only a coating of snow, a very brief period of sleet, and then mostly rain. The yard is soggy again. The shop is open winter hours in January, February and March; Thursday, Friday and Saturday from 9am to 5pm. It's a great time of year to plan your garden, read about herbs or try a new herbal project. We have ideas and materials you need in the shop! I always describe January as our slow time. But, I'm working on spring writing, organizing the shop and now, weekly seeding for the spring season. 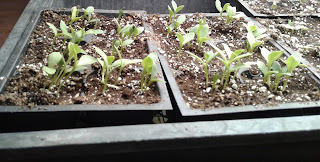 It is such a pleasure to go to the basement when the wind is howling, temperatures are dropping, and the sun shines only feebly, and see tiny seedlings growing. 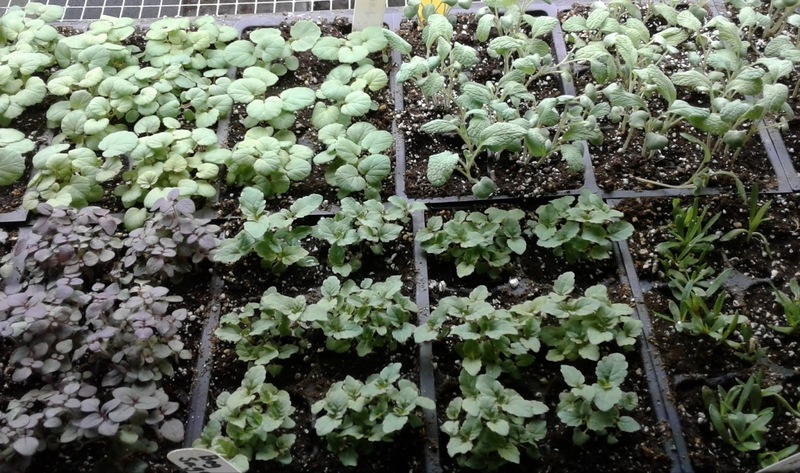 They are tiny now, but they'll be sturdy little plants by spring! 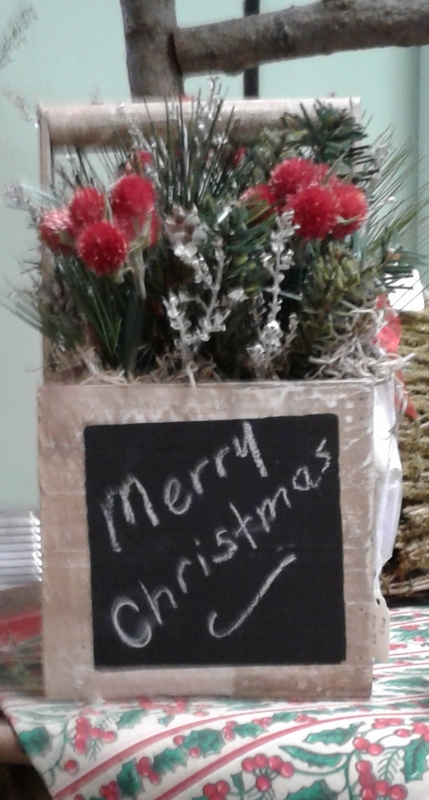 Thanks to everyone who came out for our recent holiday open house. Turnout was great and the twentieth anniversary sale was a big success. We were happy to show our appreciation to all the loyal customers who have supported us for the last twenty years. The greenhouse and shop are open Tuesday-Saturday from 9am to 5pm through December 22. After a holiday break, the shop will reopen January 10 and will be open Thursday, Friday, and Saturday from 9am to 5pm during January, February and March. Since summer was a wash out, it's been nice to enjoy some pleasant fall days. The leaves finally changed, although most of the color came in November, rather than October. 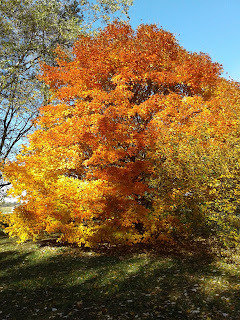 There are also some late season plants to still enjoy in the garden. One of my favorites is Mexican bush sage. It's not hardy here in zone 6, but is worth planting each year. The flowers come in late summer and bloom until frost. 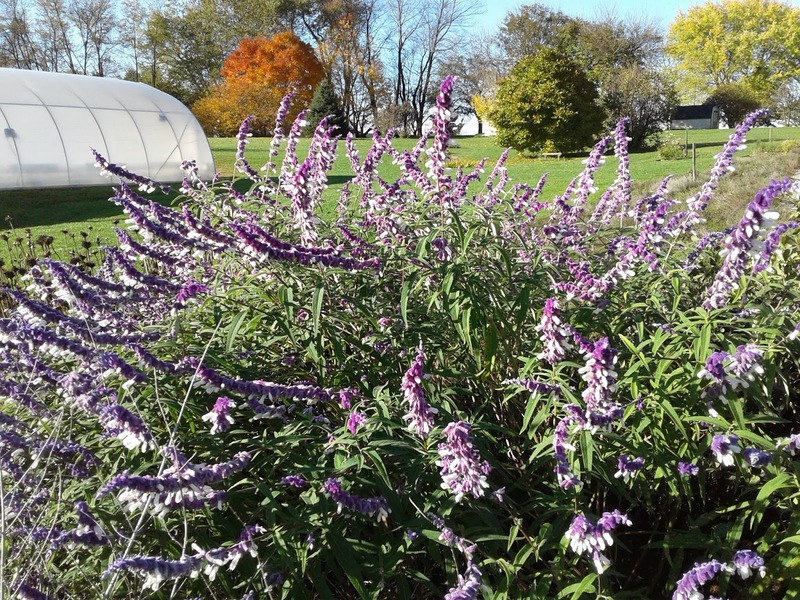 They are a lovely, purple color, with a fuzzy texture and are long lasting in the garden. The flowers also dry well. Other than final fall clean up, I've turned to inside pursuits. The shop is restocked and I've been working on holiday arrangements. All this is in anticipation of our holiday open house on Friday and Saturday, November 30 and December 1 from 9am to 5pm. The shop will be filled with herbal and gift items and we will offer live topiaries and a few potted culinary herbs in the greenhouse. During our open house, our 20th anniversary sale will offer a 20% discount on purchases over $20. I think we have finally recovered from our incredibly wet summer. 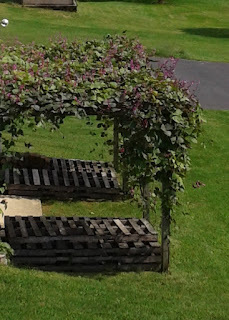 The gardens dried out and wound up looking pretty good at the end of the season. It seemed strange to be doing work in October that should have been done in August or September. 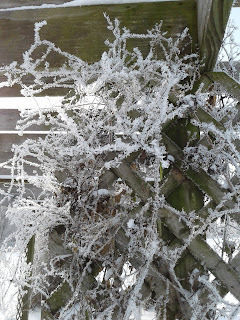 Some plants thrived and others struggled. 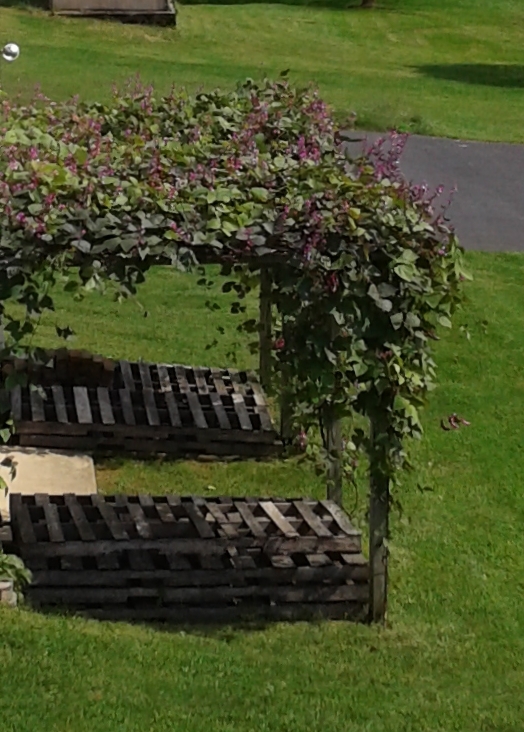 The hyacinth bean vines outside the shop were luxuriant from all the moisture. 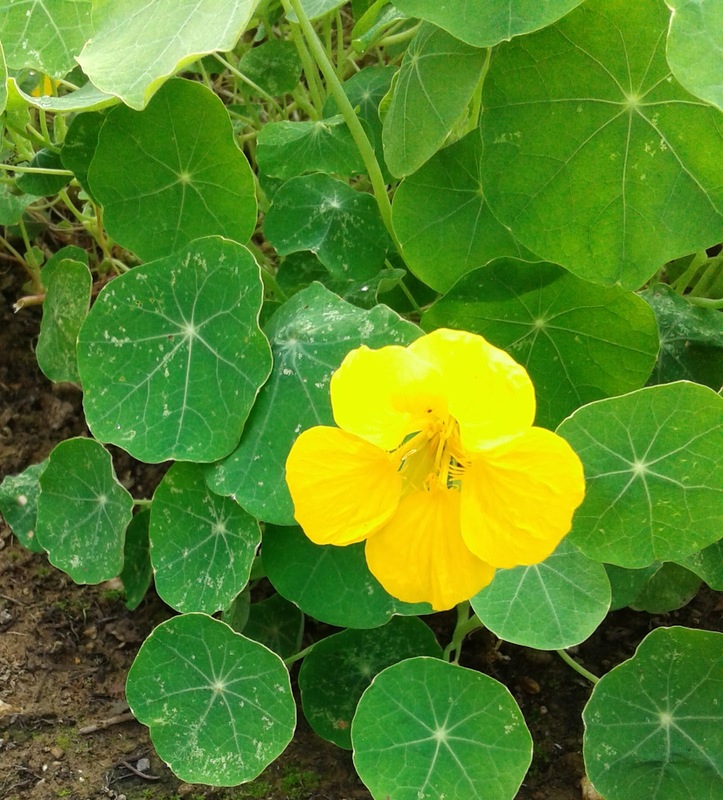 After producing just a huge mound of foliage throughout most of the summer, nasturtiums burst into bloom late in the season. Some lavenders look fine, but others have struggled. Hopefully, the winter weather will not be too drastic and will give them a chance to recover. Now, I'm turning my attention inside and preparing the shop for the holidays and working on the fall newsletter, which will be out in the first part of November. No plants at the present, but we will have a few varieties of potted culinary herbs between Thanksgiving and Christmas , along with live topiaries. After the slow start, the whole spring season seemed compressed and really flew by. I can't believe we're at our plant sale already. 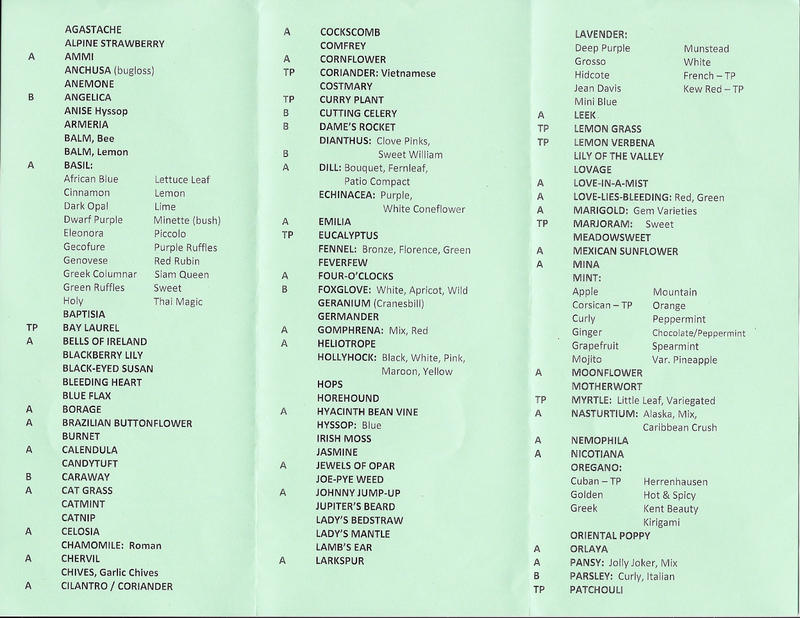 Although we're out of a number of varieties we still have quite a good selection. 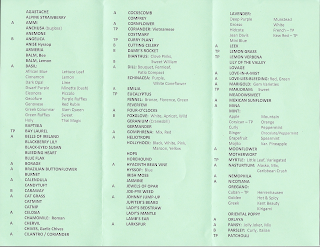 Perennials are buy 3, get one free (mix and match.) Annuals are half off. It's official- this winter was really, really hard on lavenders. We've been out of lavender plants for a month, and that never happened so early before. I've heard various explanations. I think the windy, sub-zero weather at the beginning of the year, along with no snow cover, dried plants out. And plants like lavender, that holds its foliage, would dry out quickly. With all the wet weather and muddy conditions, our garden work was also slow this spring. Now I think things are finally in pretty good shape. I'm starting to dry culinary herbs and also flowers like yarrow. Soon after we moved to our first house I decided to grow some herbs for cooking. Their fragrance and usefulness fascinated me. My hobby became an obsession, then my profession. What a great job. Running the farm is my full time job. My husband, John, who is semi-retired, helps out when he's not working at the hardware store. In spring and summer, we concentrate on plants and the gardens. In fall, we fill the shop with lots of herbal products and gifts. Winter is our slow time, but it doesn't last long. 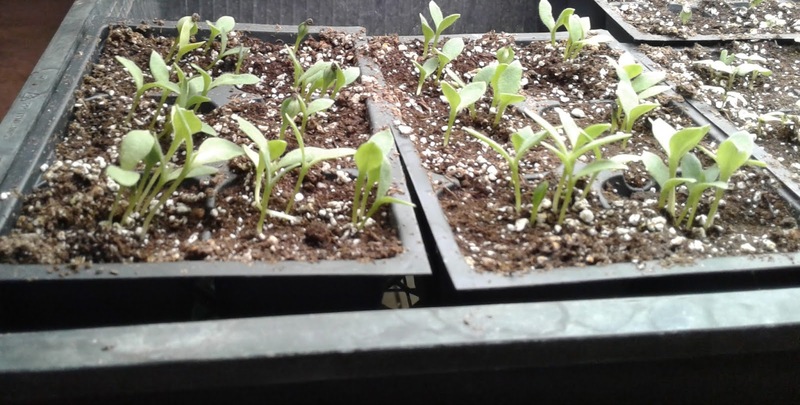 Seeding starts early so the greenhouses can be full for spring. 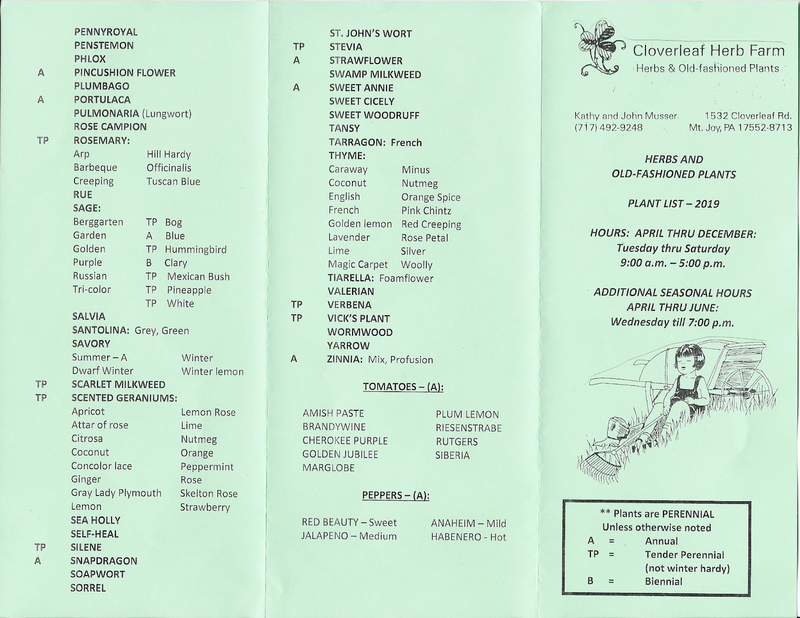 Click here for our 2019 Plant List. 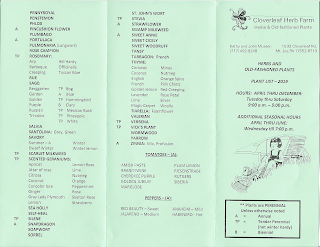 selling herbs and perennials from our own greenhouses. Our gift shop features a variety of herbal products. We are located just off Route 283 between Lancaster and Harrisburg, PA. Click here for a map.